- Under Workbench - Hydraulic power unit can be placed under a workbench or anywhere in the room. - Wall Mount: Up or Down - mount anywhere away from the door opening or even in another room. 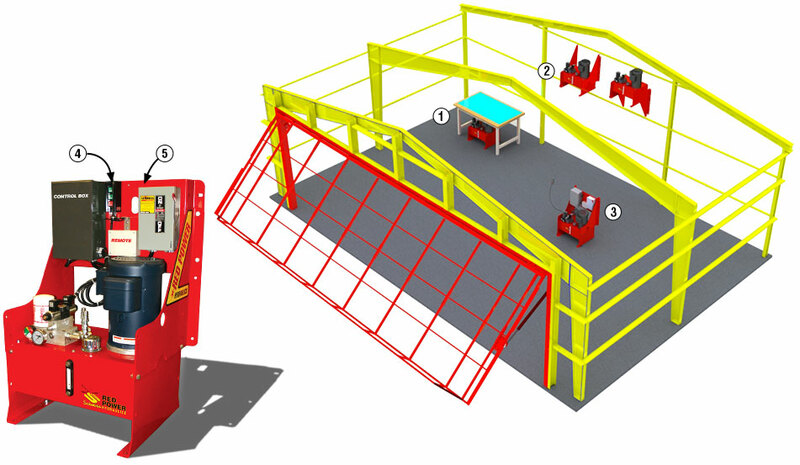 - Stand Alone Unit - Complete stand-alone hydraulic unit can be placed anywhere in the building. 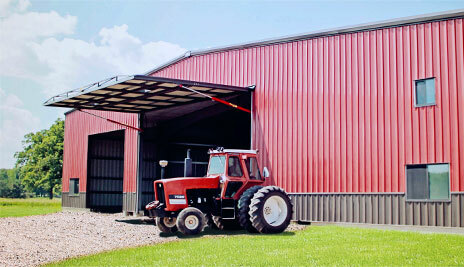 Schweiss hydraulic doors are custom made to fit any size opening for your building. Each door is built to fit your clear opening without using up existing headroom. There is no such thing as an odd size door or a job too small. You dream it, and we make your dreams come true. 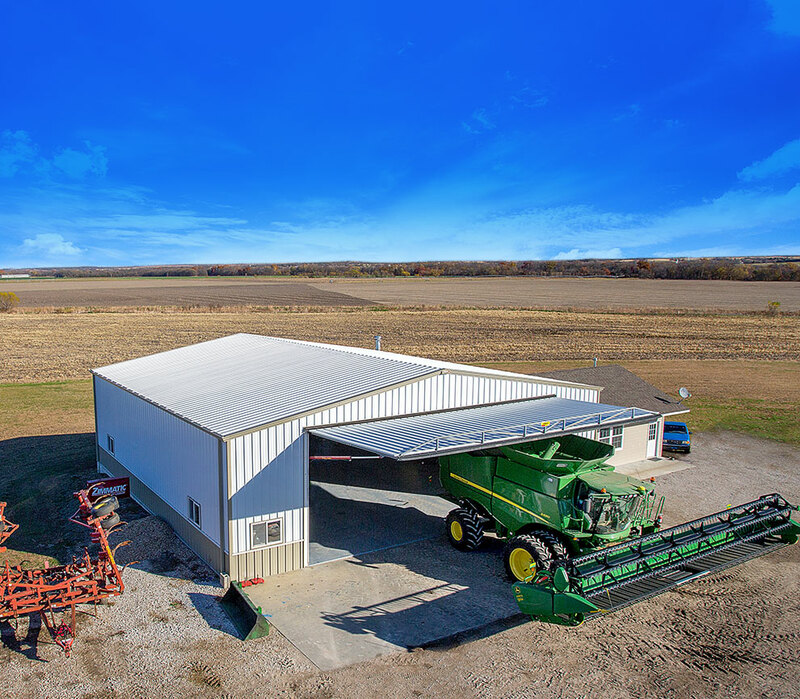 Schweiss Doors is proud of its new hydraulic doors that swing outward. Already a leader in the bifold door industry, Schweiss Doors also now offers a better hydraulic door. The door design requires zero headroom, comes pre-hung, is watertight, easy to install, easy to operate with the push of a button, easy to insulate and swings out to provide a canopy when the door is in the open position. 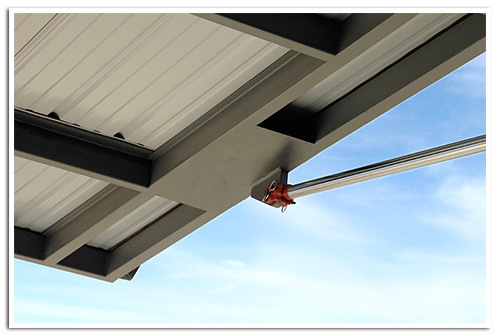 Powered by a powerful hydraulic pump, two heavy duty cylinders activate the hydraulic doorframe. Hinges across the top of the doorframe allow it to swing out and away from the building to the full open position. The hydraulic pump can be located away from the door opening to keep a clean look. GUESS WHAT - There's another backup on standby! Grab a cordless drill and run the door up! 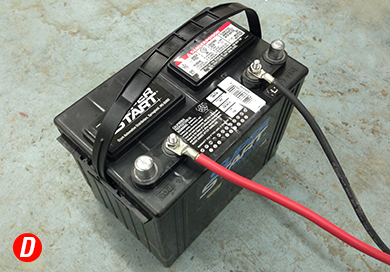 battery backup only to find out the battery is dead . . . Now what? pump motor took a puke. The Auxiliary pump in the tank will raise and lower the door with a handheld drill. If you arrive at your door and the battery is dead, now you have the option to use a cordless drill to open or close the door! The DC motor has its own stand-alone auxiliary hydraulic pump. On the top of the DC motor is a hex-head nut - use a cordless drill to open your door! it comes with its own gear-driven auxiliary pump. you can get your door open or closed under most conditions. 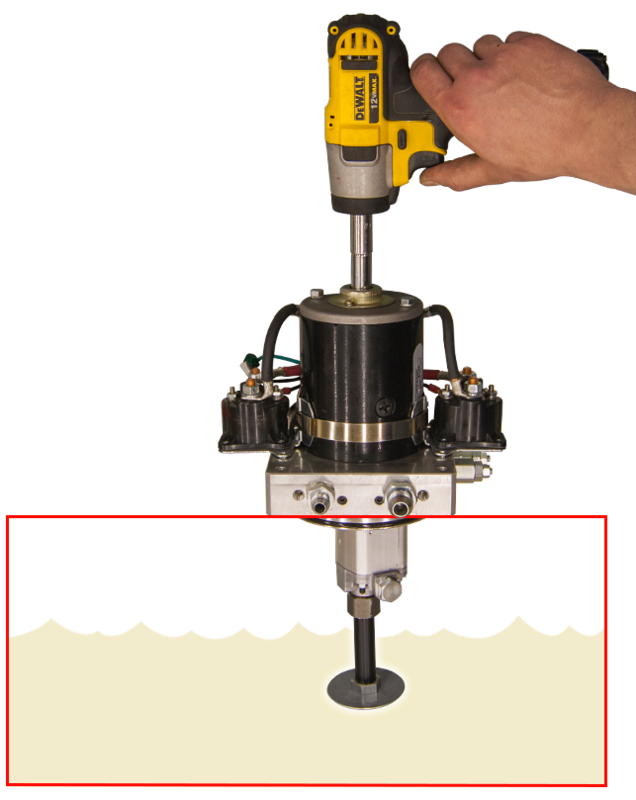 Easy operation with any handheld drill. The Schweiss robust hinges are designed to withstand the door weights and hydraulic forces of the cylinders as the door opens. Your door is only as good as its hinges! Take one look at the Schweiss hinges and you will clearly see the workmanship, strength and functionality of each hinge. The Schweiss hinges are bigger... stronger... heavier. • Schweiss hinges can be easily greased for longer hinge life. • No Oilite bushings to wear thin. • They are never welded in solid on a Schweiss door. • We take no shortcuts... All hinge pins are removable. so it had better be STRONG! GREASELESS HINGES ARE NOT A SOLUTION . . . JUST A SHORT CUT! THIS STYLE HINGE HAS BEEN TRIED BEFORE . . . AND DIDN'T HOLD UP! 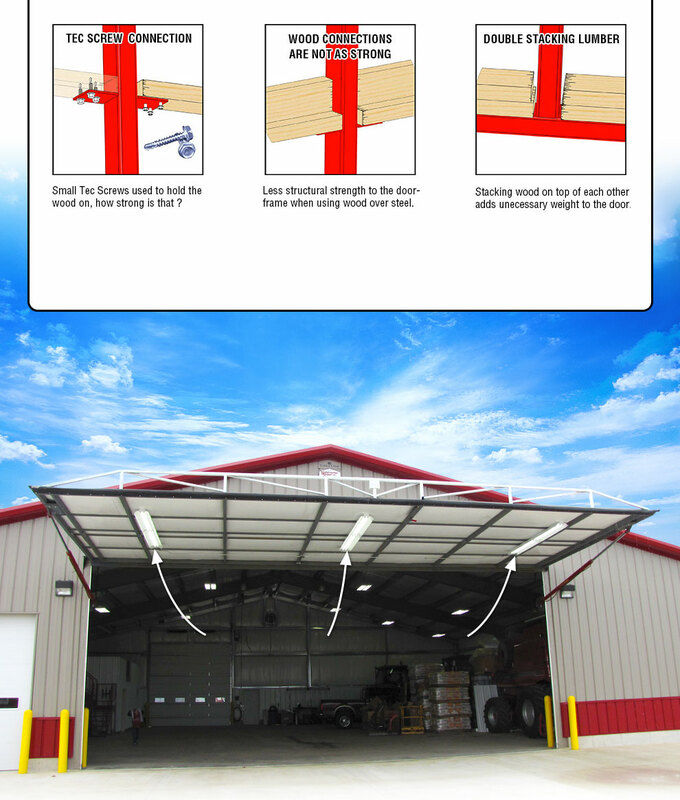 Hinge surface area is critical on large moving hydraulic doors. Over the years, we all have heard of hinge failures on others doors. 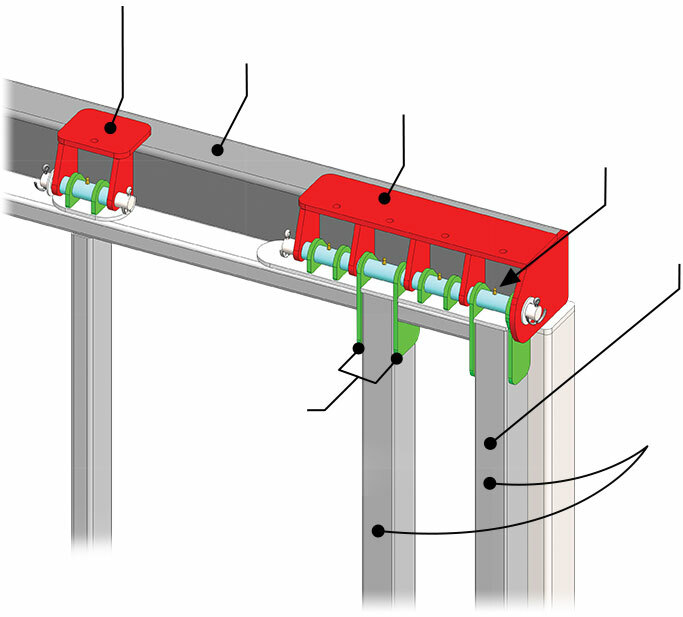 Large hydraulic cylinders are putting extreme forces on each of the outer hinges of the doorframe. Schweiss has designed and patented a robust hinge with more surface area to evenly distribute the loads of a moving one-piece doorframe. Compare the hinge surface area. The stresses on the very outer hinges are immense. With that being said, take one look at the patented Schweiss hinges and you'll clearly see the workmanship, strength and functionality of each hinge. THE SCHWEISS HINGES ARE BIGGER . . . STRONGER . . . HEAVIER! Qty 2 - 1" wide surface area contact is 2"
ROBUST SCHWEISS HINGE - 22"
It's very important to be able to grease yourhydraulic door hinges with a heavy viscosity grease. When grease is used on the hinges of a large moving door it avoids unnecessary wear and adds longer life to the hinge and the doors operation. It's a common manufacturing practice to use grease on the critical wear points and load points to avoid unnecessary wear just like in the industrial equipment world with implements such as payloaders, skidloaders and other industrial equipment that are being operated around the clock. Schweiss would never consider greaseless bushings on a large moving door - your door hinges need grease! GREASELESS BUSHING ARE NOT A SOLUTION . . . JUST A SHORTCUT! Doors when fully opened only rotate the greaseless bushings 25 percent of a complete revolution around the hinge pin. Schweiss will not use thin greaseless bushings. Since the movement on the hinge is limited to 25 percent of the surface area, this is more likely to cause uneven wear to the greaseless bushing and they may need to be replaced sooner! How do you begin to replace the bushing if the hinge pins are welded in place? GETTING THE CHEAPEST DOOR ON THE MARKET ONLY GIVES YOU A "CHEAP" DOOR! 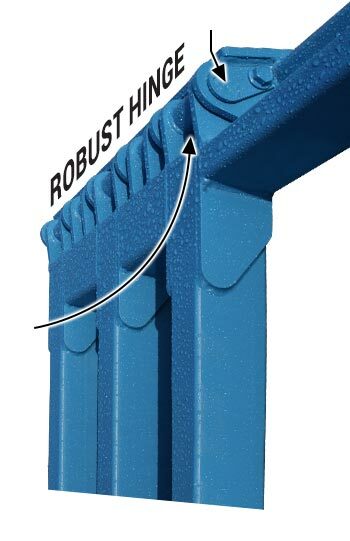 ROBUST HINGES SELL THE DOOR! "Soon as I saw and understood the spherical bearings design it was a no brainer. I was immediately SOLD on the Schweiss Hydraulic Door !" Did you buy an all-steel door? Did you expect to get wood on your steel door? Substituting wood in place of steel doesn't add structural value to the doorframe. It makes for a poor connection and weaker door frame assembly. Wood may shrink over time and may split. Tec screws used to fasten wood to the doorframe may wiggle loose over time weakening the connection. WHAT DO YOU GET WITH A SCHWEISS HYDRAULIC DOOR? Spherical bearings, an industry first! Each door comes pre-hung with frame. 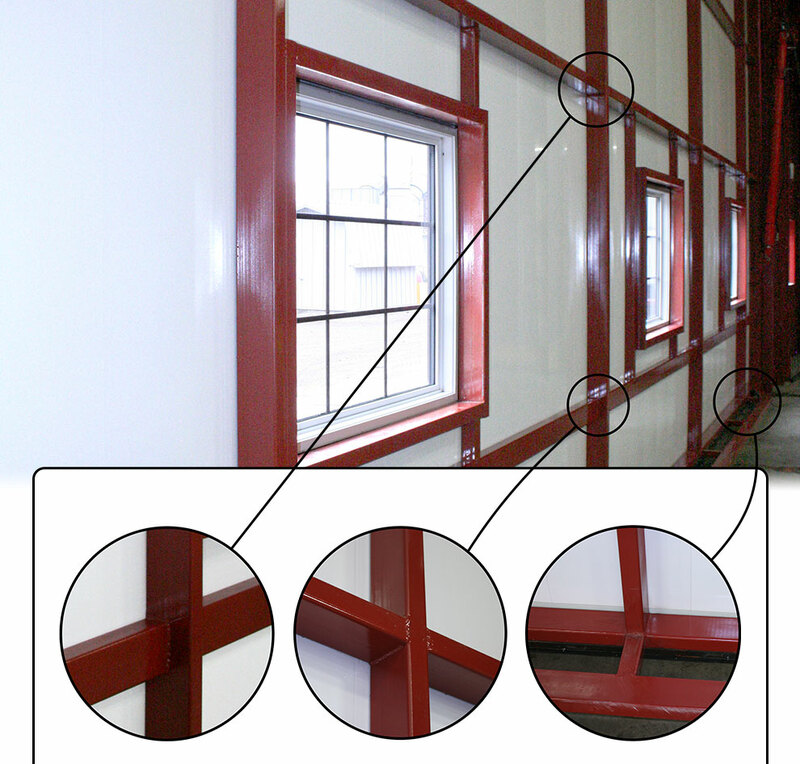 Pre-assembled, pre-welded and delivered pre-hung within its frame for ease of installation. 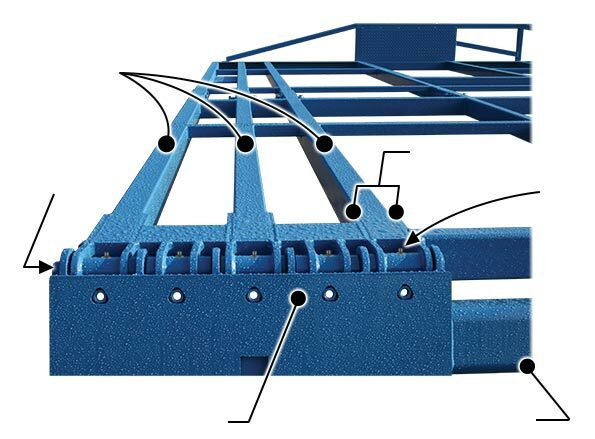 Bolted frame connections for shipping, no welding, easy to install. Best hydraulic pump on the market. Bigger, better hydraulic cylinders with spherical bearings. "LOOK FOR QUALITY, LOOK FOR PRICE, YOU'LL BUY SCHWEISS"
The Schweiss Red and Green Power manifold has a clean, crisp design. It features a polished finish, no exposed plumbing lines and a filter drainport that allows oil to drip back into the tank preventing messy oil puddles. Includes a filter clogging indicator showing when to change your filter element. 3000 PSI pressure gauge is standard and gives you the reading of the pump pressure used to open the door. Auxiliary screw-on oil filter is easy to change. Best quality filter that protects the hydraulic pump from impurities. Oil filter / breather cap / filler port has a rich looking polished finish. Clean looking! The easy screw-on cap has a built-in screen to keep debris out; important when adding oil. Sight glass displays the oil level and temperature in the oil reservoir tank. Red Power hydraulic oil reservoir has a heavy-duty, long-lasting powder-coated tank with a drain plug. Schweiss Doors has set new and higher standards in hydraulic pump development and safety features. The Red and Green Power pump/motor system from Schweiss Doors offers superior electrical components that stand leagues above others. Why? 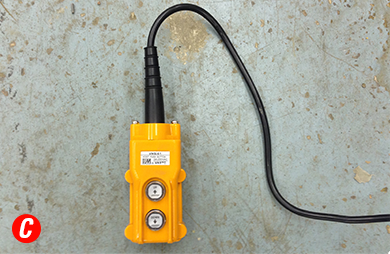 Our Red or Green Power motors come equipped with a stand-alone electrical control box. The unique design of the Red and Green Power motor system is designed with safe UL listed compo- nents. Plus, it’s composed of common components, standard in the electrical industry throughout the world. These electrical control boxes are also designed with ample space to safely house all required electrical components, such as contactors, transformers, relays, motor timers, rectifiers, and control fuses. Motor assemblies must be wired to National Electrical Code (NEC) standards. 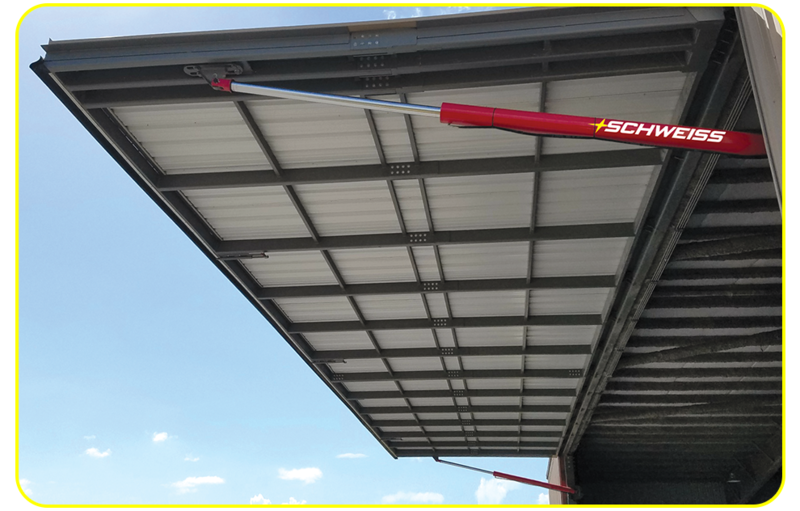 Schweiss Doors uses top-quality heavy-duty, brand name LEESON motors, totally enclosed, fan cooled, with a common 56C face mount standard shaft size, powering a single gear-driven pump. Plus, these quality continuous-duty motors are safety-backed with fuses and overload protection. Locks door up or down and holds the door safely in all positions. Locks and holds the door in the closed position... Never creeps open. The doors will lock up and hold if a hydraulic line bursts or leaks. Doors operate evenly in either direction. 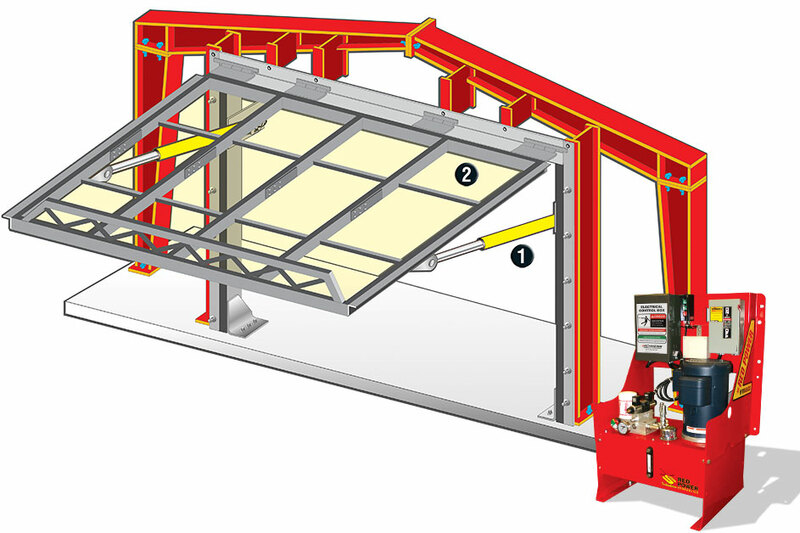 Allows you to safely lower door in an emergency from the ground level, no ladders needed. Prevents thermal expansion in the cylinders. Releases excess pressure and oil back into the tank. 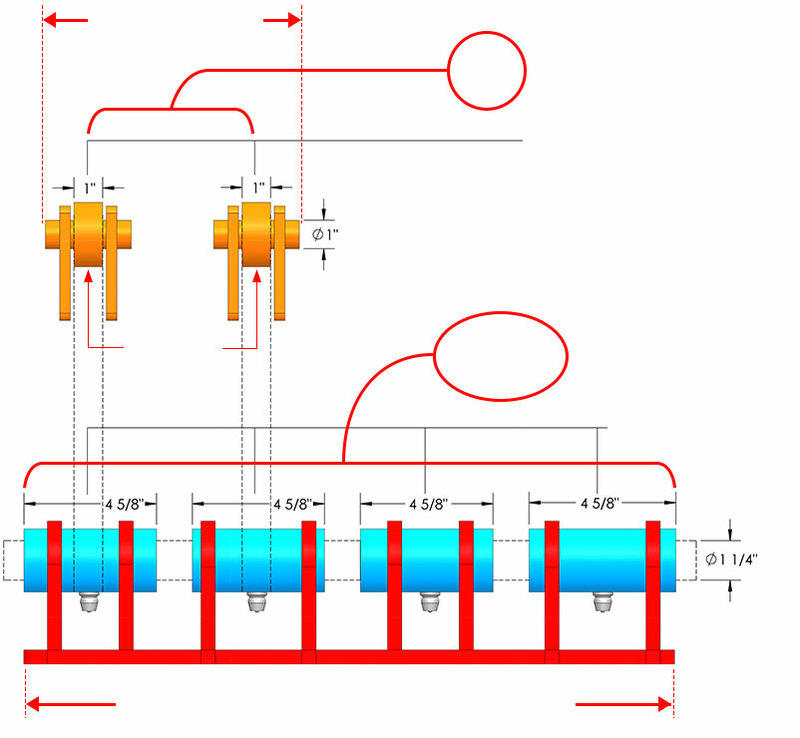 Hydraulic directional control valve has a built in manual override in case the coil burns out. You can push the override on the valves to manually get the door to move in either direction. Low voltage control stations... only 24 volts DC, safer working with low voltage! Low voltage coils... lighted 24 volt DC coil connectors are safer to work around. Built in emergency lowering feature is standard on all Schweiss Doors. No tractor is needed in case of a power outage! DC backup - Includes battery operation and drill-driven back-up. Has its own auxiliary self-contained pump and motor! 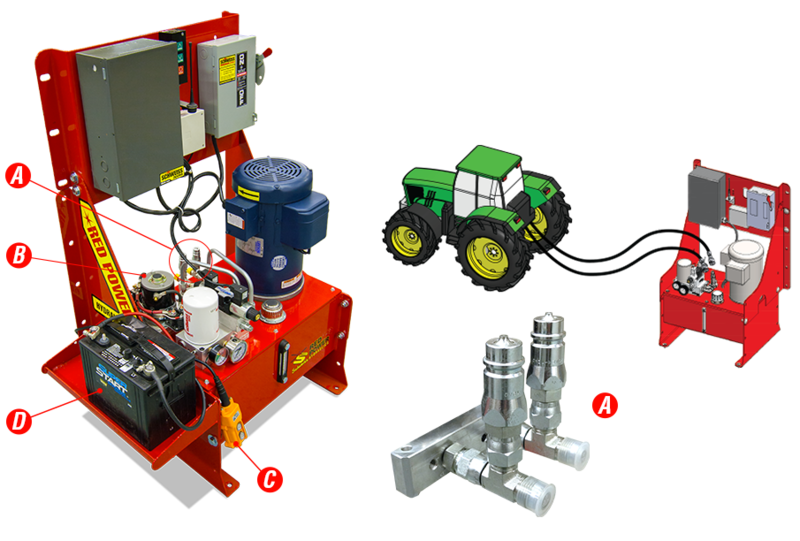 Complete stand-alone hydraulic unit can be placed anywhere in the building. 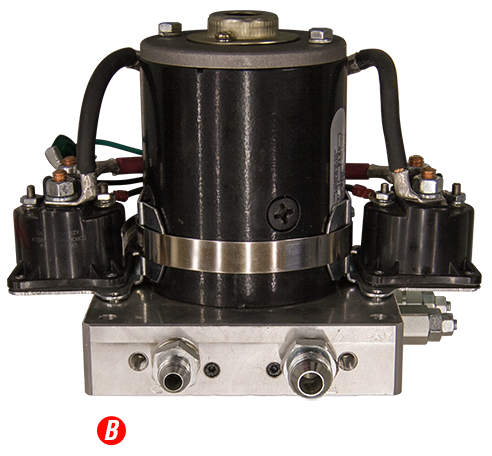 Hydraulic power unit can be placed under a workbench or anywhere in the room. Wall mount - mount anywhere away from the door opening or even in another room. With Schweiss you have options! Each door comes prehung with its own frame. Bolted frame connection for shipping. No welding and easy to install. Building does not have to be made taller. Easy to install with detailed pictorial instructions. 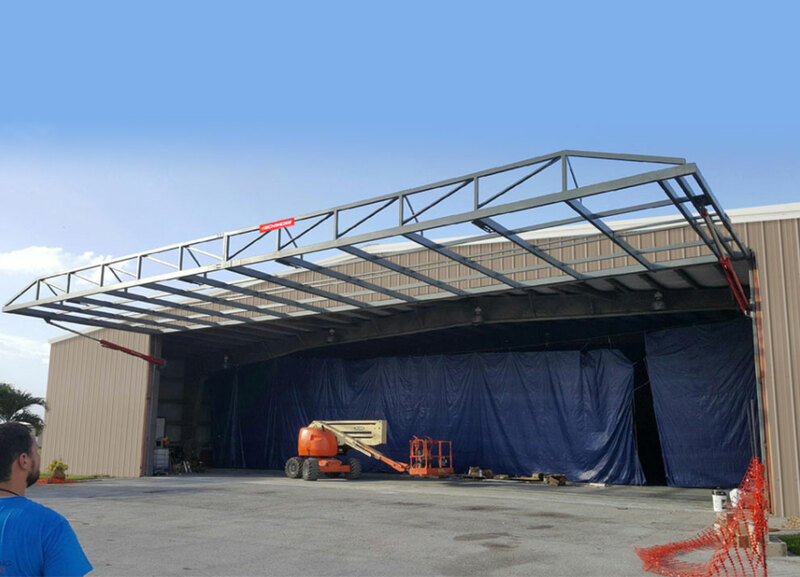 Internal truss available at no extra cost. your finger off the control station. 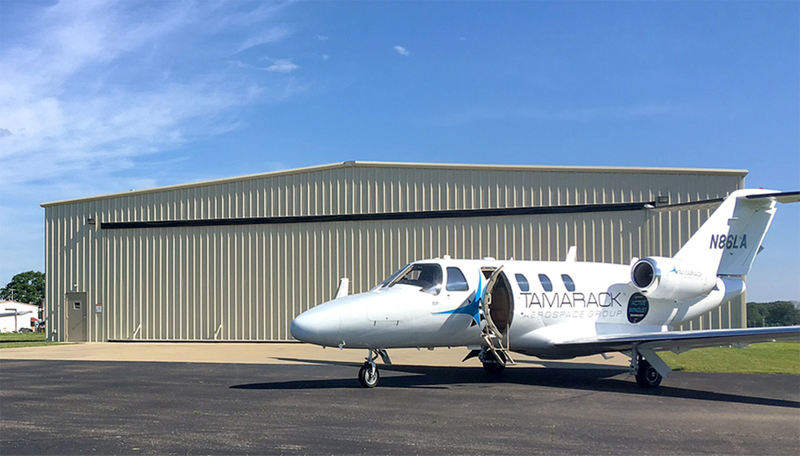 maintenance, and emergency backup operations. be placed on your building and door. Cycle time: approximately 30 seconds. Each door has a standard speed preset from the factory. We can vary the speed of the door, just ask for it. Self-Latching and holds the Door in Place. to provide a tight seal. Push a button to automatically lock and unlock the door to the closed position. providing a constant weathertight seal. Flush Mount... (H Style) Requires 5" Headroom. Each door comes prehung with subframe. Outside Mount... (M Style) Lose No Headroom. Each door comes prehung with subframe. Wind-loaded doors (to meet standard local codes). Engineer stamps available and approved in all 50 states. Every Schweiss door is properly prepared for painting. The doorframe members and parts are finished with gray primer. We offer matching touch-up paint to take care of any slight nicks or scratches. Custom paint jobs - Upon request, we will custom paint your door to match your building. Schweiss is ready to shift gears at any point. This is the key to our success, whether it be marketing, designing or creating new products. With this attitude and flexibility we have introduced new Aluminum galvanized doors. Call for special pricing. We Do Doors, More Doors and Better! DO YOUR OWN RESEARCH AND LEARN MORE! Do they have a factory? Do they even manufacture their own doors? Do they seem too eager to take your deposit? If you call in and there's no sales person available to talk to you. If you call in and you are told " I'll have someone call you back. " If you call in and you only get voicemail. Is there a slow response to emails . . . or no response at all. THE SCHWEISS WAY . . .
Have additional door questions that need to be answered ? . . . just call in ! 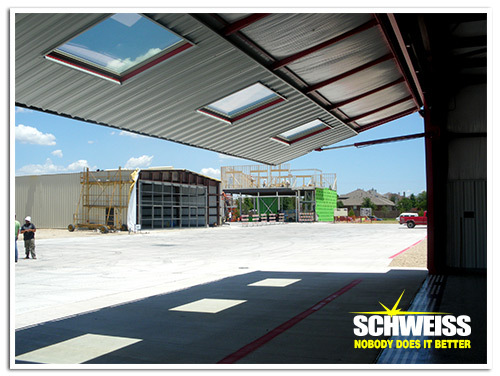 LET SCHWEISS MANUFACTURE AND DELIVER YOUR NEXT DOOR!